The piece opens with a somewhat dissonant wailing drone, but then quickly charges into a layered heavy stoner riff, that repeats (MIDI-fied echo-playback unit obviously in use here) as Kesselring then adds in additional counterpoint statements on the off-beats, and eventually a fuzzy soaring lead break over the top. I remember a Swedish (?) guy named Bond Berglund doing this sort of on-the-fly composition technique live (ironically also in a former Catholic church in Pittsburgh, PA) as an opening act for The Brain (Farflung electronic alter-ego) and Cluster (Moebius & Roedelius), and it was very effective and I’d always wanted to hear more of this kind of thing. Anyway, by the time we’re six minutes in, Kesselring has ramped up the energy full blast and he’s shredding on the strings, and then stomping on the wah and delay pedals for the initial denoument. Movement Two is the eerie minimalist drone segment, with just some incidental sounds as the backdrop for the bowed guitar statements. Kesselring really teases you here, letting the various tones and chords bleed out of the instrument and echo through the cathedral a bit more slowly than the listener would normally expect, and the sense of anticipation for the next stroke keeps you involved. Finally, at fifteen minutes in, the heavier fuzz-echo riffs return and we get into some heavy echo drone that is a bit reminiscent of the kind of thing that Sunn O))) does. Frankly, the hooded Sunn-gods rather much bore me to death, but applied in moderation and mixed in with a number of different textures as Kesselring does here, the end effect is anything but boring. By the time the final strands of reverb-guitar come slowly to the landing, crisscrossing the runway in waves of sonic disturbance and fuzzy echo, “Metalgazer” has proven itself to be really quite a nice affair indeed. Check it out. 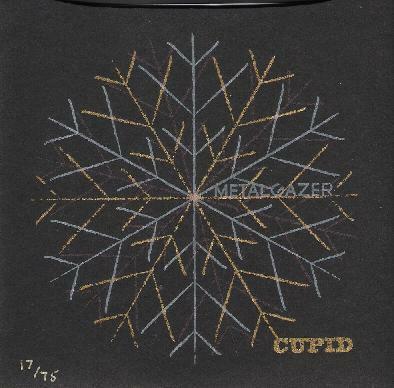 Metalgazer has been released in a simple paper-sleeve packaging as a very limited edition of 75, each individually numbered, and can be obtained from http://www.magusbooks.com.